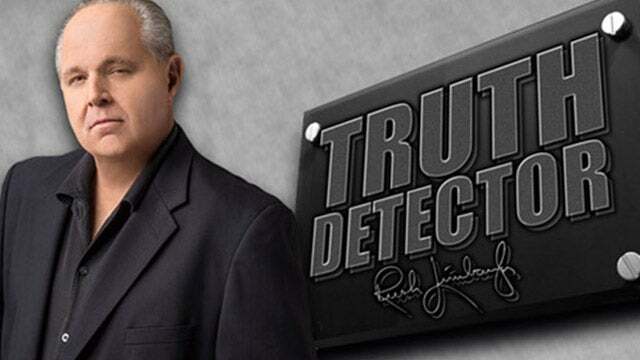 RUSH: I don’t know how you can say first and foremost. But one of the items is the firing of Andrew McCabe and the fact that he is not losing his pension. Andrew McCabe was not fired by anything Donald Trump had anything to do with. Andrew McCabe was fired after an inspection, an investigation of the FBI and its handling of the Hillary Clinton email mess by the Office of Inspector General. The Office of Inspector General, the head of that agency, was appointed by Barack Obama. And the original reason for the internal investigation of the FBI was because Obama and the Democrats were livid that Comey reopened the investigation late in October before the election. And what happened was, when the investigation got going, the inspector general in fact found something the exact opposite of what the Democrats expected to see. They found that McCabe had lied to investigators. Now, in the process, McCabe was fired after both the inspector general and a review board within the FBI made the recommendation. Trump had nothing to do with it. Jeff Sessions had nothing to do with it, other than carrying it out. The media knows all of this. The media knows every syllable of what I just said to you. The media is making up that McCabe will lose his pension. He will not. That’s not what he lost. He lost early access to some benefits. He did not lose his pension. But they were so successful at creating this fake news that various Democrat members of Congress were offering to hire the guy for three days so that he could qualify. Now, here is a guy who has been found to lie by an Obama-appointed investigator, and the Democrats circle the wagons to protect this guy and to hold on to his pension, which they think is under threat. Meanwhile, over here, Michael Flynn has lost his house. Michael Flynn is broke, when he didn’t even lie to the FBI, according to the agent who interviewed him, who happens to be none other than Peter Strzok, who is best buds with Andrew McCabe. Over here, Paul Manafort faces a year, perhaps a lifetime in jail as an out-of-control independent counsel is literally on a fishing expedition with no specific crime given. This special counsel is now inventing charges. He is inventing things to charge people with, such as conspiracy to defraud the United States. There is no such charge. He’s making it up. He is doing the work of the legislature. If he has supposedly found all of these outrageous violations of existing law and statue, then why is he not charging these people with those instead of inventing something that doesn’t exist? And that’s because he thinks nobody’s gonna stop him. Because he is the man of impeccable integrity and reputation inside the Washington establishment. Now, I think the media, after an initial sob story reaction to McCabe getting canned, they went overboard. I think they’re starting to pull back from this, because they’ve realized what I just told you. McCabe was fired, recommended to be fired by two independent agencies, one of them a Democrat appointed investigator by Obama for lying to FBI investigators. And you want to know what else is interesting? I’m speaking rapidly here, folks. I’m trying to dial it back because there’s simply a lot to say here and my mouth is unable to keep up with my brain. So I’m gonna dial back the mouth here. Slow down a little bit. What people have begun to realize is that McCabe going public defending himself and denying this stuff has implicated Comey as having lied under oath about not leaking anything about the Trump investigation to the media or the Hillary investigation, because that’s what got McCabe in trouble. He did leak things to the media about FBI investigations and lied about that. And when he went public, he said the director approved everything he was doing. Well, Comey testified under oath that he didn’t leak anything ever, no time, to nobody. And now McCabe is saying he leaked with the approval of the director. So Comey’s big book is coming out this week and McCabe may have inadvertently turned the tables on Comey. So now the Drive-Bys, after an initial push on defending McCabe, are pulling back on it, I think, because even they realize there’s a big problem here. Michael Flynn is broke. Michael Flynn had to sell his house all for supposedly lying to the FBI about something that had nothing to do with Trump colluding with Russia and, again, for the umpteenth, gazillionth time, there wasn’t any of that. But, meanwhile, the same people that are applauding Michael Flynn being destroyed are defending Andrew McCabe, including the Drive-By Media. So they’re pulling back. RUSH: Now, on the subject of McCabe losing his pension, this is from Forbes.com. The headline: “No, Andrew McCabe Is Not ‘Losing his Pension’ … In fact, McCabe is all of 49 years old, likely 50 by the time readers see this,” meaning his birthday was, I guess, Sunday or today, whatever. “[W]hat he lost out on was … the ability to take his benefits at age 50, rather than somewhere between age 57 and age 62, and he lost his eligibility to a special top-up in benefit formula. 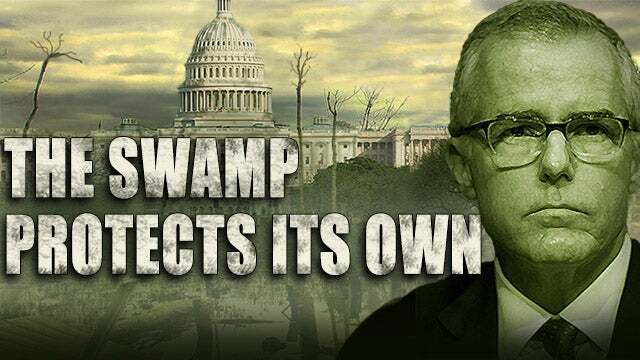 This is, in fact, one of the great benefits of the swamp is you are exempted, oftentimes, from the same consequences average Americans face in similar circumstances — and, of course, McCabe knew to go out and appeal to people. (sobbing) “I’ve been victimized! This is happening to me because of Trump and Russia investigation,” and it is not. This has nothing to do with that. This is Hillary’s email investigation and Donald Trump and Jeff Sessions were not part of this investigation. They didn’t order it. Obama did! It’s Obama people throughout this inspector general investigation of the FBI and the DOJ that ensnared McCabe. 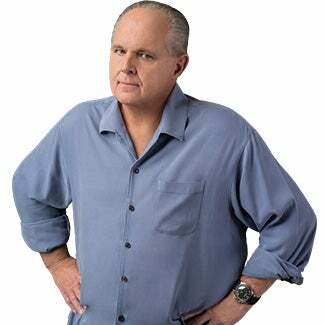 RUSH: If you watched it this weekend, I think you can see it’s becoming abundantly clear who the deep state is. This overreaction they had to McCabe getting canned, Andrea Mitchell crying about it. Andrea Mitchell, NBC News, Washington, essentially asking a member of Congress to hire the poor the guy so that he doesn’t miss his pension. Do you know that McCabe has a net worth of $11 million on a salary of about $180 to 200,000 a year. (interruption) What? Worried about a pension, yeah. And the source for this is Peter Schweizer’s new book about people in the establishment who show up of average means and end up leaving as millionaires, how they do it. And one couple that he investigates, Mitch McConnell and his wife. But this is the question that we’ve always all wondered. How do these people, how does Harry Reid show up with no more than his salary to his name and end up owning gobs of acreage all over the southwest? How does that happen? Robert “Sheets” Byrd’s another great example from West Virginia. Well, Schweizer in his new book — name of it escapes me, but I’ll find it in a minute — has endeavored to investigate this to find out. But Andrew McCabe, according to this, has a net worth of $11 million. Mueller’s net worth is said to be $3 million, I think. And within the establishment that’s chump change. Don’t doubt me. But it’s still a lot of money, and it’s very sufficient. Now, the reason I was waiting for the printer to spit something out, remember we had this call, the last call of the previous hour from Gina just down the road from Saratoga in upstate New York. She reminded us of a New York Times piece in June of 2013. Jim Rutenberg our old buddy wrote it on the masterminds of digital, all of the brains and all of the geniuses who were working for Obama to mastermind and master the harvesting of digital data for the advancement of the Obama agenda and his reelection effort in 2012 and how they had pulled it off. The article praises these people from Facebook and Google as brilliant, and Obama’s team working with them as brilliant. They’re geniuses at harvesting data. So what we did, we went and did a simple little Google search. Let me read some of the headlines the Google search produced. “The Obama Campaign’s Digital Masterminds Cash In.” That’s the New York Times story, June 20th, 2013. “Obama’s Strong Embrace of Divisive Security Tools.” The New York Times, June 6, 2013. That’s even before the big piece by Rutenberg. “President Obama’s Dragnet.” The New York Times. “White House Plays Down Data Program.” The New York Times. “Data Mining Our Dreams,” the New York Times, October 8, 2013. All of this is about Obama. “Data Mining Without Big Brother,” the New York Times. “Mining Electronic Records for Revealing Health Data.” The New York Times. All of these are in 2013. And all of them have to do with the Obama administration or his allies and their proficiency at mining personal user data from Google and Facebook and any number of other places. In other words, Obama’s been doing it and he’s been getting away with it, and he’s been praised as a genius along the way. Forbes: No, Andrew McCabe Isn't "Losing His Pension"